When I interviewed him about his thesis, studio art major Tiye Pulley ’19 told me that he loves religious paintings with their angelic and demonic figures, but that he wanted to “paint them like my own disturbed and bloodied angels.” Stepping into List Gallery last Thursday, I noticed the religious inspiration immediately in the intricate and sprawling nature of the artwork, yet the style and emotion was strikingly unusual. Comic-and-graffiti-style paintings covered the entirety of nearly every wall in the room, as well as three wooden boxes in the middle, all painted in black against a white background. The paintings consisted largely of black figures—luxury clothing, and hair prominently displayed—many of them part-serpentine or part-angelic. Comic-style word bubbles and miniature figures accompanied much of the larger artwork, filling up white space. Pulley’s work sought to explore the boundaries of form, shaping his artwork to fit the variety boards and papers that he worked on. It consisted of a mix of huge paper panels and massive plasterboard chunks that were originally the walls of his studio. Part of the appeal of working in scale on the walls themselves was the ability to force people to look at his art. The painted wooden boxes looked almost like a three-dimensional game of exquisite corpse, with each side following the lines from around the corner but forming an unrelated image. He played with the human form as well, making many of the figures with wings or reptilian body parts and emphasizing the gender ambiguity of his figures. Pulley told me that he reads a lot of comic books and manga and that he likes to think of his exhibit “as a deconstructed giant comic book and these are all just panels and you can start anywhere and finish anywhere.” I like the idea of it being a sort of comic book of Pulley’s mind projected onto List Gallery, dark and dramatic and beautiful. I even caught him referring to the figures in his paintings as “characters” a few times. Walking through the curtained entrance to the back room where Anna Marfleet’s (’19) work was displayed, I noticed a dramatic difference. Contrasting Pulley’s loud and chaotic work, Marfleet’s was instead tranquil and ordered in an intensely alluring and visually satisfying way. Unlike the complex geography of the front room, the back room was simple and square, perfectly suiting the geometric artwork displayed there. All three walls displayed nine paintings of perfectly geometrical houses with absolutely no people or animals and extremely minimal decor. They mostly depicted the exterior, all including dramatic shadows. The paintings were slightly unsettling, many of them producing the feeling that action was occuring just out of frame given that they depicted so many places where people reside devoid of any actual people. The paintings were divided into twelve groupings with a single number above each grouping and the titles of each were listed near the door. The titles ranged from “THE BLADE OF AN OVERHEAD FAN – MORNING” to “THE DOGS ARE BARKING – NIGHT.” Each title drew a distinct mental image and emotion associated with a specific time of day that the paintings perfectly fit. The temporality is what motivated the twelve groupings; for Marfleet, the quotidian appearance of the number twelve was particularly important. Each painting managed to carry a specific emotion that seemed to perfectly fit the title and time of day it was grouped under. Marfleet told me that it was her intention to make each painting feel like the frame of a film, an appropriate choice given her film and media studies minor. The paintings only took up a portion of the paper they were done on, each with a filmlike aspect ratio. They were created to feel empty, as if a movie scene had been paused at the wrong moment with the characters just offscreen. Marfleet got her inspiration by wandering the streets of random locations on her computer using Google Maps. Yet her paintings were not exact replications of the houses she saw, she described them as “houses that could not exist in real life.” Nevertheless, looking at the images as the distorted houses of unknowing real people amplified the discomfiting nature of the paintings. I felt as if I was looking through someone’s personal space without their permission. 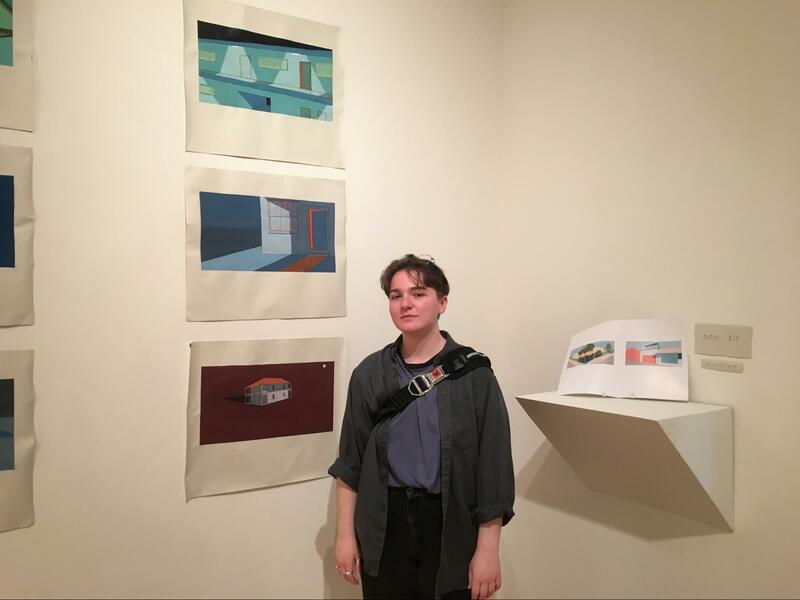 Although it was her thesis, Marfleet never wanted her artwork to function as a summation or capstone of all her previous artwork at Swarthmore. “It was just the next project that I set my mind to,” she said. 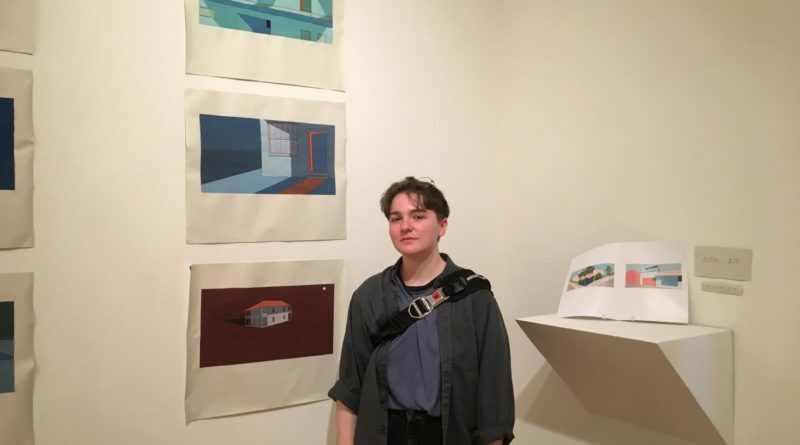 Together, the two exhibitions made for an impressive start to the senior thesis exhibition series displayed in List Gallery, and based on how full last Thursday’s reception was, I’m sure that the other attendees would agree. I’m excited to see the receptions to come. Be sure to check the next one out this Thursday in List from 4:30 to 6:00 p.m.